Removing the smog equipment is not recommended! This is only to be used for reference. Well, one day I decided I was tired of chasing down vacuum leaks and I was getting some popping that could be related to the PAIR valves. I found out that Two Brother's Racing had come up with a smog kit for the Valk. Well, after jetting my bike and dealing with all the different hoses and valves I thought wow, this would be worth a $100.00 just to find out what to take off and what to leave on. It is a real nightmare in there. Let me just say at this point that TBR was one of the first ones to come up with anything new for the Valk and they still have some of the best products on the market for the Valk. This is not one of them. It's not that the product is so bad as much as there is very little help as far as instructions. After talking to Craig at TBR I can see why he won't go into great detail on his kits. I guess that if he says turn this screw out 1.5 turns and it takes 1.75 turns then people call him all day telling him why his instructions are wrong. Being that as it is he does say on the first line that if you don't feel comfortable with removing your smog then take it to your dealer. There are two problems with that, one is you don't read that till after you have bought the kit, and two, most dealers won't remove the smog on a bike. So , what I have done is put this together so if you did buy the kit you can put this on yourself. It's not that bad if you have some help like this. As you can see here what you get for your $100.00 is four of the round plugs and two of the flat plugs. You also get four screws that are just for looks,and a allen wrench. The round plugs have clear tape on them to hold in these little pins that push out when you turn the allen set screw. The reason the tape is there is because the pins will fall out if it didn't have the tape on. How do I know that? You guessed it. I lost one of the pins right off the bat and had to take some welding rod and make a new one. It took forever just to get the goop off that the tape left behind. I am told that if you use some carb cleaner that will help. These parts are not chromed or polished. They are just cut down raw material. If that wasn't bad enough the directions were totally useless. From here it was rip and tear and hope my bike ran when I was done. The one thing that was hard to figure out was what to plug and what to leave open. By the way TBR's kit is short four rubber plugs for the intakes and one hose that goes to the gas tank. Even if I did have good direction's I still would have had to make a run to the parts store. Now here is the good news. I figured out how to do this kit for about $10.00. That doesn't help me at this point but it will help you. Here is a step by step on what to take off and what to plug. With PICS! You start by pulling all the valves off and the evap can. This is what it should look like when all of the smog is gone. The six hoses that you see on top are not the overflow hoses like I thought. They are purge tubes on CA bikes only. Three of us were able to run with this unplugged with no effect on performance. One guy couldn't get his bike to rev over 3K with this unplugged. Another guy lost power and had a terrible dyno chart because of leaving this unplugged. We took one bike that didn't seem to be effected by leaving this unplugged and went ahead and plugged it, it did not effect it one way or the other, so it is now our recommendation to go ahead and plug this. It is still a mystery why this did not effect my bike when this was left up plugged. I apologize for any bad information I may have given you about these tubes but I had no other data that told me this was a problem. 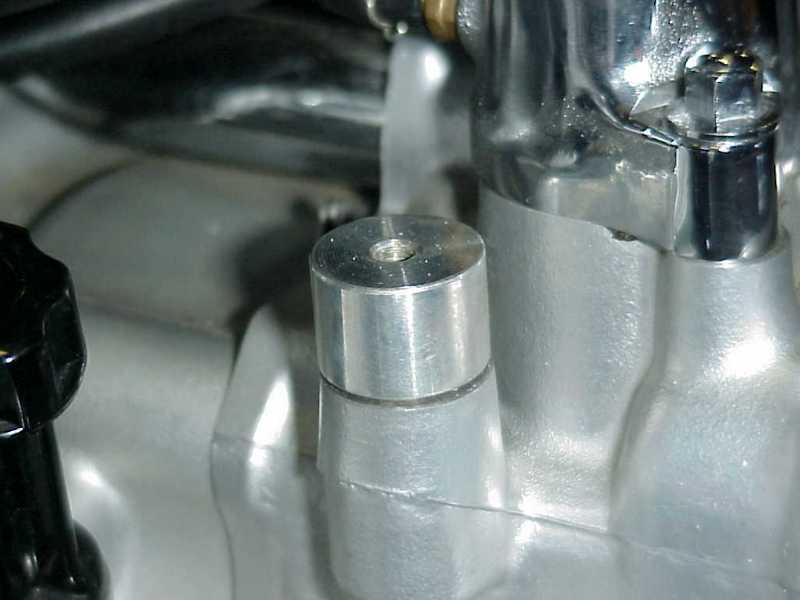 There are six hoses at the bottom of the carbs that are your drain hoses. You can take those off too if you want. I left mine on. The other two big hoses that go to each carb bank are your fuel supply. I would leave those on if I were you. Now, what to plug and what to hook up. There is a tube that is about 3/8" in size on both carb banks. DO NOT plug this! How do I know that? You guessed it again didn't you? This was the only big mistake I made on the whole deal....besides buying the kit that is, this is a carb vent tube, it needs to be open or not only will it not run right but when you go to pull the caps off of the back of your intakes it will puke fuel all over the place. That was my first clue I did something wrong. What I did is just swiveled it down. Now here is where your $10.00 comes in. I should at least get a dinner out of someone for this. Go down to your parts store and buy six 3/8" rubber plugs and four 1/8" rubber plugs. The 1/8" plugs are for your intakes and the 3/8" plugs are for your chrome tubes that use to go to your PAIR valve. While you are at the store pick up a couple feet of tube that is just over 1/8". This is the only hose that you will be hooking back up. You don't need to pull the chrome tubes off, this is just so you can see it better. To me the tubes don't look bad, if you want you could try and locate a plug to replace the one that TBR sells and just make a cap plate for the bottom one. That is what Chuck B. did. This is the down and dirty way and it looks and works just fine. Once you get the carbs back on you can hardly see the tubes. But there is a big difference when you look inside and all that junk is gone. By the way some people think that only the CA bikes have this junk on it, take a look in your bike and you will see that you have the PAIR valves and lots of hoses. This is where you want to hook up the tube you had to buy at the store. You know the one that doesn't come with the kit. This tube is where you pick up vacuum for your gas tank. Just pull the one hose off and stick the new one on and hook it back to the tank. I guess that's about it. All the tubes that come off of the crankcase stay on and hook back into your air box. What you may find after doing this mod is you may be running a little leaner now. You can take some of that out by adjusting your pilot screws out but to do it right you should rejet. We did Brad's bike last night and went ahead and rejetted and the thing runs GREAT! The good news is jetting is a piece of cake now that all that stuff is gone. Took me two hours to change the mains, slow jets and take out the shims. The next thing I will have for you is how to jet your bike. I have the pics I just need to write it all down. Hope this helps and if I can help you with anything let me know.